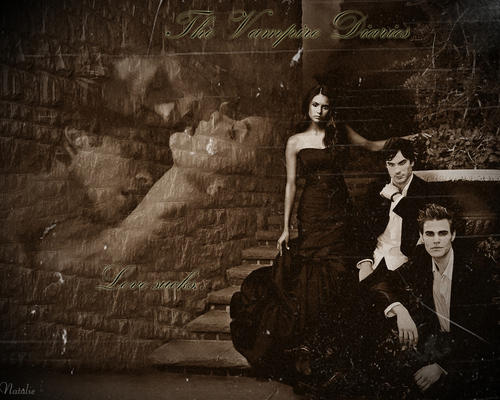 Vampire Diaries. . HD Wallpaper and background images in the Vampire Diaries club tagged: the vampire diaries elena gilbert katherine damon stefan salvatore the vampire diaries wallpaper. This Vampire Diaries wallpaper contains mitaani, mji eneo la tukio, mijini mazingira, jiji eneo, and mijini kuweka. There might also be ishara, bango, maandishi, ubao, matini, ubao wa chokaa, bouquet, corsage, posy, nosegay, suti biashara, and biashara suti. Looks Vintage. the effect worked nicely. Good job, Hi5!! !